If there is a cuisine that America can truly call its own, then this has to be it. So much so, that I'm going to make no attempt to replicate the many and varied recipes that make up that country's version of "salad". Hopefully, one of my readers will take up the challenge and produce a cookbook that is devoted entirely to American salads in all their glory. It's really very simple. Fresh, brightly colored ingredients, stuffed with flavor and oozing with contrast in terms of texture and appearance. In my view, heaven on a plate. But you don't have to wait for the cookbook to come out. Just use your imagination. One of the backbones of an American salad is the use of crisp. fresh lettuce, and in particular the younger leaves. A classic example of this is the Caesar salad, which has gained a firm foothold here in Australia. from the strange concoctions that find their way onto Sydney restaurant tables. everything must be fresh. Guess what the third rule is? I knew it. You are way ahead of me! You also need to consider color. I'm not talking about the violent clashes that fruit such as tomatoes can introduce, although they may be very welcome, but simply go back to basics and always try to introduce at least three colors into your dish. The same is true of flavors. There is no need to stop at three, but you certainly should not have less. Salads are great. Because they are usually cold,(warm chicken salad is an obvious exception) almost any number of flavors can be introduced without canceling each other out. amount and variety is infinite, limited only by your imagination. Salad leaves are much more delicate than they first appear and will reward careful handling. Try to avoid washing them, for example; just wipe them with a damp cloth or sponge and dry them with kitchen paper afterward. That's important. 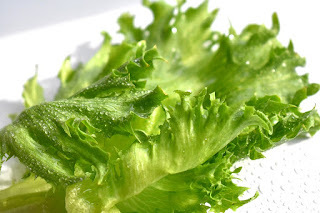 Salad dressing will not stick to wet leaves. It contains oil, remember. And above all, never ever cut salad leaves with a knife. They will quickly go brown at the cut edge and limp shortly afterward. Instead, tear the leaves with your hands just before serving, which is also the time to add any dressing. Treat any herbs, such as basil, that you may be adding in exactly the same way. The later you leave this, the crisper your salads will be. In this way, you can keep your salad leaves wrapped in a plastic bag in the crisper compartment of your refrigerator right up to the last moment. Treat them well and they will keep fresh and crisp for days. As general rule salads need to be dressed. Personally, I find that the simplest dressing is the best, but having said that I don't want to anticipate what our future author of "Great American salads" will have to say on the subject. After all, it may be you. There is, however, a simple rule of thumb which is very useful to know. The classic French dressing, vinaigrette, is really made up of only two ingredients. One is lemon juice (or wine vinegar), and the other is olive oil. And there is a definite relationship between the two. lemon juice to three parts olive oil. A softer dressing is produced by using four parts olive oil. Now, once you know that, it really doesn't matter whether you are using lemon juice, vinegar or any other acid-base, the proportions are exactly the same. What's more, you can easily introduce some terrific flavors into that base. Try this, for example, one part balsamic vinegar, three parts olive oil and a few drops of truffle oil. When it's fresh, this is sensational. But it's still very good even after three or four weeks in the jar. Sometimes I think I may never use any other dressing. One final point, there is only one good way to dress a salad - with very clean hands. There just is no better way to get your dressing evenly distributed over every glistening leaf, without over-doing it. Now, as a departure from my normal practice, I'm going to list some ingredients which go to make up a really good, hearty salad. You can select some of them, all of them or none of them, but I hope they will give you the inspiration to put together salads which are way ahead of the dreary tomato, cucumber and limp lettuce that finds its way on to so many summer plates. Whisk this combo until blended and combine with the leaves just before serving. Pile into a serving dish which you have rubbed with a raw garlic clove, and dust with grated pecorino or parmesan cheese. carrot, raw cabbage, hard-boiled eggs, cold poached eggs, warm poached eggs, cold chicken, warm chicken, croutons, cooked beans, tuna fish, anchovies, toasted pine nuts, walnuts, tomatoes, cucumbers, citrus fruit, parmesan cheese, pecorino cheese, apple, pear,raw egg, Worcestershire sauce, Tabasco, chilies, gherkins, capers, cooked meat, cooked and raw fish, prawns, crab, lobster, mushrooms, asparagus, broccoli, and just about anything else crisp and edible that you can think of. Has this given you a clue? Great! Maybe you really will be the one to produce our "Great American Salads" cookbook. Now let me give you an easy family salad which you can also share as a lunch with friends. using two forks; one grated, hard-boiled egg; one tablespoon balsamic vinegar; four tbs grapeseed oil; one raw egg yolk. Serve with bread and white wine, both of which should be fresh and crisp.